Another pristine evening greeted paddlers at the Grab Gear Surfski Challenge, race ten of the 2019 Marine Surfski Series as Jenna Ward and Matt Bouman claimed the respective women’s and men’s race wins on Friday. Despite the fact that both the men’s and women’s series titles had been decided already, the racing was exciting once again with Euro Steel’s Ward and Michelle Burn fighting it out for the line honours in the ladies race. Ward was in great form on Friday evening and she powered her way to another win in the series which took her to four wins, leveling the series with Kyeta Purchase who also won four races. The pair will share the overall series honours. The ladies race was an exciting one with Ward only managing to get herself a 20 second gap over Burn but holding on to that advantage to the finish. In the men’s showdown SMG’s Bouman showed his class to claim another win in the series and also wrap up second place on the overall standings behind Hank McGregor. Perennial runner up Gene Prato wrapped up another second place finish on Friday but one of the performances of the day was Lee McGregor who finished third overall. The Grand Master beat a number of younger paddlers to take the bottom step on the podium. Zoog Haynes and Clyde Barendse were the first double home and second boat across the line with Brendon Delport and Richard Lowe in second and the mixed pair of Danica and Brett Bartho in third. It was the mixed doubles pair of Shaun Burgin and Paige Dennison who were the first boat across the line in the short course with the single ski of Mthembeni Mkhize sandwiched between the winners and third place Reynard van Antwerpen and Kendra Robinson. Young under 16 paddler Saskia Johanna Hockly was the first women’s single ski over the line in the short course. Talking after the final race, series organiser Barry Lewin has been encouraged by this years numbers. “We had another big field for the final race of the series which is a testament to the whole series,” Lewin said. “We have had some terrific weather and conditions and that has helped in getting the numbers down to the water on Fridays. The series has run the Funk Pants Family Feud throughout which has encouraged parents to take on the short or long course with their children and Lewin believes that this has added to the amount of youngsters taking part. “Pushing the family element through the series this years has been a great addition and has led to the increase in numbers. 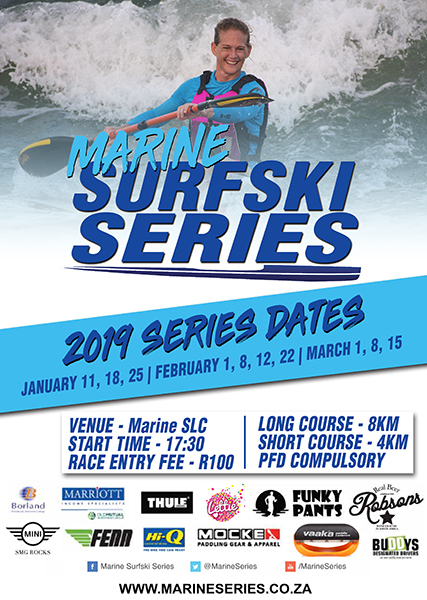 “This along with the lifesaving clubs around the city bringing their youngsters to the races has been brilliant for surfski paddling in Durban,” Lewin added.